California policymakers have been dealing with large shortfalls in the state's budget for most of this decade. A precipitating cause of these operating deficits was the major stock market-related decline in General Fund revenues that occurred at the beginning of the decade. Tax receipts fell by over 15 percent between 2000-01 and 2001-02, leading to estimated annual shortfalls of $15 billion for two years. Recent rebounds in revenues, coupled with various budget savings actions, resulted in a narrowing of these shortfalls, although significant imbalances remained as of mid-decade. General Fund revenues account for nearly 80 percent of total state revenues. Personal income taxes are the largest single revenue source, accounting for 54 percent of General Fund revenues and 43 percent of total revenues. 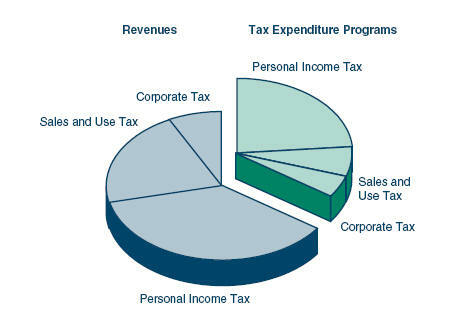 Sales and use taxes and corporation taxes are the second and third largest General Fund sources, accounting for 30 percent and 11 percent, respectively. Special funds are used for specific purposes, with motor vehicle-related levies the largest single component. Over the past four decades, personal income tax revenues have increased dramatically—rising from 22 percent to 54 percent of General Fund revenues. This growth is due to growth in real incomes, the state’s progressive tax structure, and increased capital gains. The reduced share for the sales tax reflects in part the increase in spending on services, which generally are not taxed. California has a highly progressive personal income tax structure—that is, taxes as a percent of income rise as one's income increases. Basic marginal personal income tax rates range from 1 percent to 9.3 percent. In 2004, taxpayers with income of $500,000 and over accounted for about 1 percent of returns, but 39 percent of tax liabilities. The recent passage of Proposition 63, imposing an additional tax of 1 percent on the portion of incomes above $1 million beginning in 2005, has likely increased the tax share of high-income taxpayers from that shown above. Sales taxes vary from county to county because of the optional sales taxes that counties can choose to levy. Sales tax rates can vary within a county as well, to the extent cities and/or special districts adopt additional optional taxes. County sales tax rates range from 7.25 percent in counties with no optional taxes to 8.75 percent in Alameda County, and the cities of Richmond (Contra Costa County), Avalon (Los Angeles County), and National City (San Diego County). 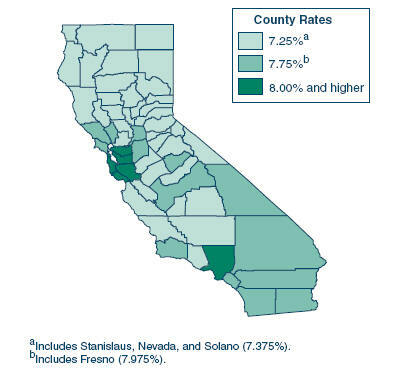 The statewide average county rate (weighted by sales) is 7.94 percent. The tax gap is defined as the difference between what taxpayers owe and what is actually collected by the tax agencies. Individuals represent about 85 percent of the income tax gap and businesses the remaining 15 percent. In addition to income taxes, there are also significant tax gaps associated with sales and use taxes and certain state excise taxes. Tax expenditure programs (TEPs) are special tax provisions that result in lower tax liabilities and are used to encourage particular activities, reward certain actions, or provide tax relief. Broadly defined, TEPs represent foregone revenues of roughly $40 billion annually. This compares to revenues collected of about $90 billion. Currently, the largest income tax TEPs are the home mortgage interest deduction, the exclusion from income of pension contributions, the exclusion of employer contributions to health plans, and the special tax treatment of S corporations. State spending declined in the early 1990s due to the recession. During the rest of the decade, however, spending grew rapidly—averaging 8.1 percent per year for all spending and 9.3 percent for General Fund spending. Spending was relatively flat following the 2001 recession, but growth has returned. Real per capita total spending, which controls for both population growth and inflation, has averaged 1.9 percent annually since 1992-93. The composition of total state spending (General Fund plus special funds) has evolved over time. Health and social services programs' share has increased over the period while transportation's share has declined. While a relatively small portion of the total, criminal justice's share of the budget has nearly tripled. K-12 education remains the single largest program area, accounting for almost a third of total spending. Together, education, health, and social services account for nearly 80 percent of total General Fund spending in 2006-07. Education’s share of General Fund spending is over $50 billion—around 50 percent. Health and social services represent the next largest share of total General Fund spending at 29 percent ($29.3 billion). a K-12 participants are in average daily attendance and higher education participants are in full-time equivalents. c Includes funds for the Habilitation Services Program. The costs shown are average amounts. The range is especially large in the Medi-Cal program, as children can cost around $1,000 a year while disabled nursing home patients can cost about $70,000 annually. Of the total $101.3 billion 2006-07 General Fund budget, state operations comprise only about one-quarter ($23.8 billion). These state operations include the various expenses incurred at the state government level, such as state employee salaries. In contrast, the remaining three-quarters primarily involves local assistance—that is, monies spent at the local level—including funds for education, health, and social services programs. About three-fourths of General Fund state operations is in just four areas: the Department of Corrections and Rehabilitation, debt service, the University of California, and the California State University system. In 2005‑06, the state employed the equivalent of 330,140 full-time staff at a salary cost of roughly $19.3 billion (all funds). Employees in higher education represented more than one-third of the total. The state has many positions that are authorized but not filled. The current vacancy rate is about 13 percent. In the last 30 years, state employment has ranged from a high of 9.9 employees per 1,000 population in 1977‑78 to a low of 8.4 employees during the 1990s. In 2005‑06, there were an estimated 8.9 employees per 1,000 population. On this basis, California ranks 48th among states in the level of state government employees. In 2006‑07, General Fund costs for state employee and teacher retirement benefits are an estimated $3.7 billion. Unfunded liabilities of California's two largest state pension systems currently total $45 billion. We estimate that state government’s unfunded liabilities for retiree health benefits are between $40 billion and $70 billion or perhaps more. Under new governmental accounting guidelines, actuaries will determine the amount of this liability for the first time in 2007. As of September 2006, the state had $44.5 billion of infrastructure-related debt outstanding. Of this amount, $36.7 billion involved general obligation bonds and $7.7 billion was for lease-revenue bonds. K-12 education's share of total infrastructure-related debt is $22.4 billion—or about 50 percent. Higher education represents the next largest share at 17 percent ($7.7 billion). Prior to the November 2006 election, the state had a total of $26.6 billion of voter-approved general obligation debt that was not issued. (About two-thirds of this amount, however, has been committed to projects.) This is mostly in the areas of K-12 education, resources and environmental protection, and stem cell research. The voters approved $42.7 billion in additional general obligation bond debt in November 2006 which will be sold in future years. The level of General Fund debt-service payments stated as a percentage of state revenues is commonly referred to as the state’s debt-service ratio (DSR). This ratio is used as one indicator of the state’s debt burden. The DSR for infrastructure bonds increased in the early 1990s and peaked at 5.4 percent, before falling back to below 3 percent in 2002-03. It stood at about 4.2 percent in 2005-06, but is expected to increase to a peak of 5.9 percent in 2010-11 as currently authorized infrastructure-related bonds are sold in the future. When deficit-financing bonds authorized by the voters in Proposition 57 are included, the DSR stood at about 5.5 percent in 2005-06, and will increase to a peak of 8.4 percent in 2009-10 when the deficit-financing bonds are scheduled to be fully repaid.